It was just a few months since we had witnessed the Tibet riots, and the response of the world towards the Chinese oppression > according to how the massive majority of western media presented the events. 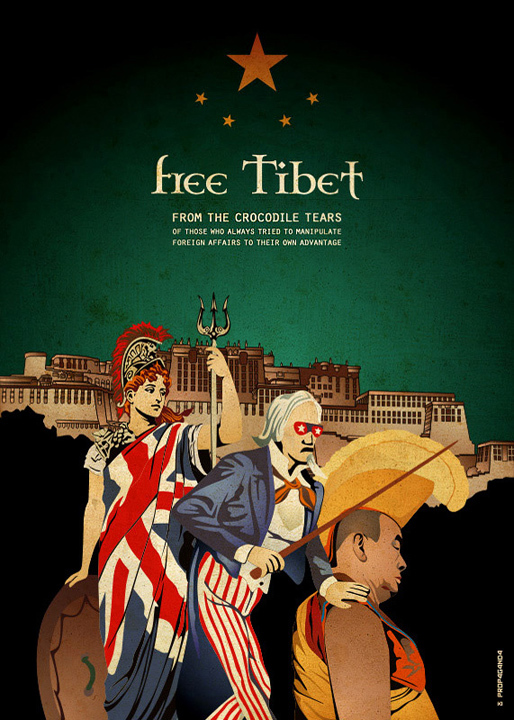 No matter what really happened there, i couldn't help feeling cynical towards all those people who rushed to lift 'Free Tibet' banners while most of them don't even know where Tibet is situated, or are totally unaware of what lies beneath this conflict. I was also rather annoyed seeing the Olympic Flame Relays get ruined by (clueless?) protestors in various places around the world, who took the risk to mix up political issues with what is maybe the greatest sport (and peace) event known to mankind. One could wonder why China bothers so much the western media, as if the rest of the world is heaven. I say it might be the big players not wanting a strong rival to get stronger. Britannia was vectorised after the original of a William Parkinson giclee print. Uncle Sam was vectorised after the original of a Dalyrmple political cartoon (color lithograph) entitled "School Begins" (Puck, 1898) - Hawaii State Archives.